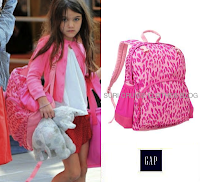 Katie Holmes with her daughter Suri Cruise arrive at the airport in New York City on March 28th, 2013. 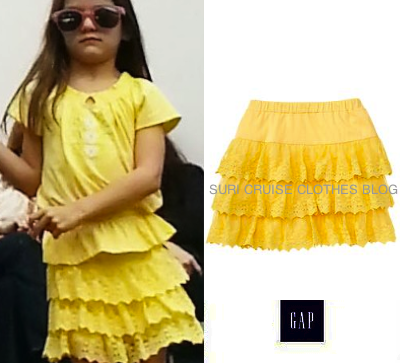 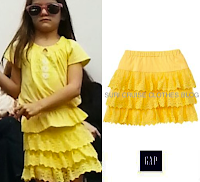 Suri is wearing Embroidered Daisy Top in lemon zinger ($12.95) and Tiered Lace Skirt also in lemon zinger color ($24.95), both by Gap Kids (she first wore this outfit on March 25th, 2013). With Plum Sunday Rose Coat by Addie & Ella F/W 2012 Collection (she first wore on January 3rd, 2012), Bailey Bow Boots ($140) by UGG Australia (she first wore on December 23th, 2012) and Pink Leopard print backpack (out of stock) by Gap Kids (she first used it on august 17th, 2012).